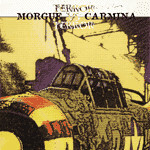 In Music We Trust - Morgue / Carmina: Split 7"
Two of France's most cement cracking bands team up in an effort create a soundtrack to the end of the universe. MORGUE spit our two tracks of their precision grind. While unmistakably reminiscent of bands like BURNT BY THE SUN, MORGUE definitely forge their own trail by incorporating death metal worthy brutality into their sound. Which makes a perfect compliment to CARMINA; a band that has mastered death-inspired grindcore. Playing with a precision reminiscent of bands like OBITUARY (although faster) they pull out all the stops on both their tracks. Listening to CARMINA is like experiencing someone doing a brain biopsy on you while your still conscious. The top-notch packaging and orange vinyl only add to the quality of this record. Released by a team of labels, I got mine from Shogun.